Attention Bernal Heights cinemaphiles, auteurs, special effects gurus, show-runners, and red-carpet sycophants: The 2015 Bernal Heights Outdoor Cinema season gets underway on Friday, with a glamorous opening night Film Crawl on Cortland. 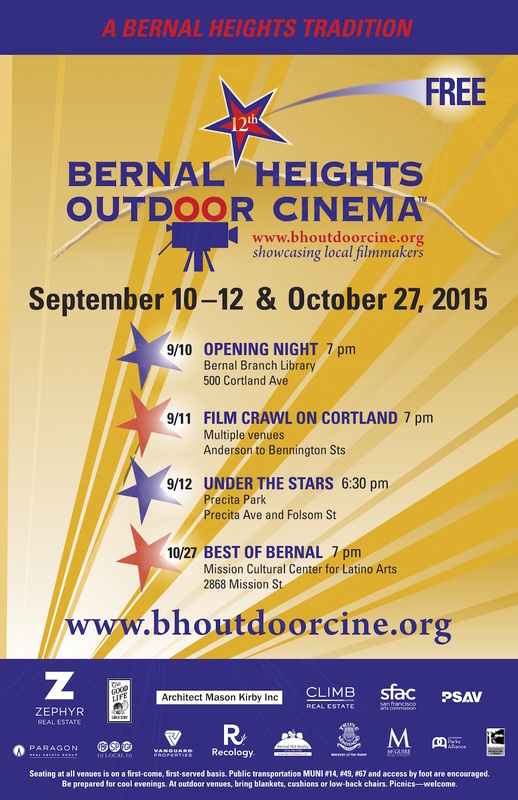 Bernal Heights Outdoor Cinema is back for our 12th season and we’re coming back to Cortland. We need volunteers for Friday’s Film Crawl. With six venues simultaneously showing screenings at 7:00, 8:00 and 9:00pm , takes a good number of volunteers to pull off what has become the highlight of the weekend festival. Volunteers are asked to do pretty light-weight duties e.g. audience direction, greeting, etc. In exchange they receive an official 2015 hoodie tee, reserved seating at other venues and an invite to the “wrap party” for filmmakers and sponsors/advertisers. 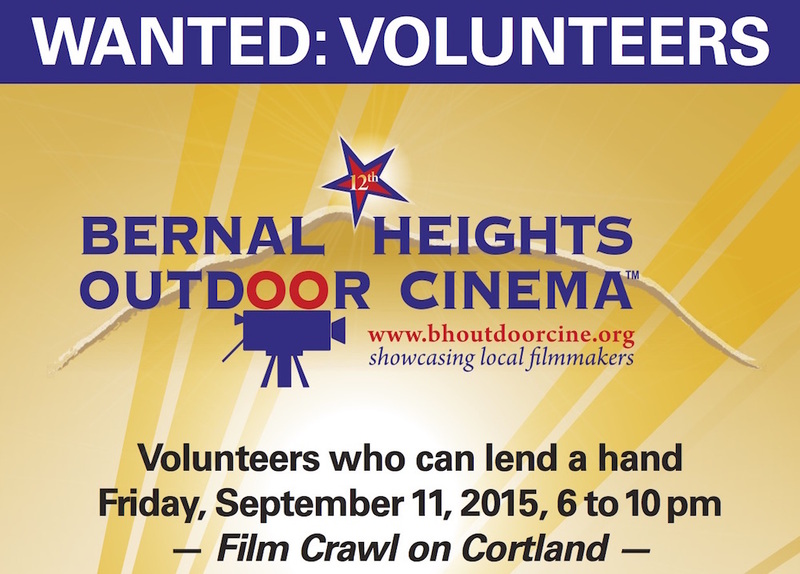 To volunteer, contact us at info@bhoutdoorcine.org. BHOC moves to fashionable Precita Park on Saturday night, September 12. 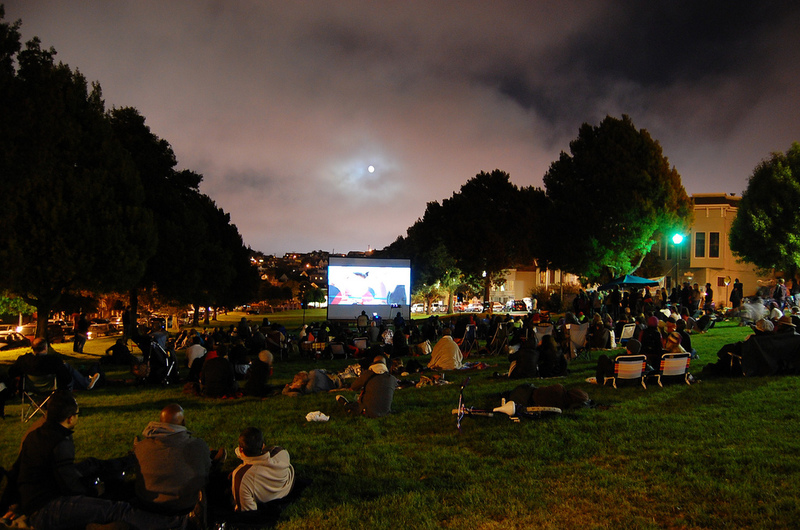 For the complete schedule, check out the Bernal Heights Outdoor Cinema website. When it was several films shown in Precita Park I was a regular attendee. It was a good chance to meet Bernal neighbors. But now that it’s spread over many venues and has all the fanciness, it’s lost a lot for me. Why do things like this have to grow into professional events? Why can’t they stay home-grown?